How do you build a great company? You hire great people. How do you hire great people? You look for great resumes. Seems straightforward enough, but can a resume truly reflect a person’s quality, character or potential? Is it possible that by focusing on resumes, we are missing out on exceptional talent? Our Dublin office recently partnered with Technology Ireland on their Women ReBOOT initiative, which is specifically designed to build a bridge between technology employers and highly skilled women who have been out of the workforce for some time. The program helps us to identify highly skilled talent within the region that we may have otherwise missed. Women ReBOOT supports women who are considering going back to work after taking time off to tend to family and personal matters. The program is structured and built on four pillars which include providing eLearning courses to help update technology skills, two-week mentored company work-placement in order to become familiar with today’s tech sector, monthly group seminars to enhance professional development, and one-on-one professional coaching to build confidence. The program was first introduced in February of this year as an initiative led by Technology Ireland and Software Skillnet to support diversity and address the gender imbalance. MongoDB Technical Services Engineer Clare Scally was invited to speak to the group on behalf of MongoDB regarding her experience working as a full-time mother and as a woman in tech. ReBOOT participant Mary Gorman had been in the developer space for almost 10 years until she decided to take personal leave to be with her four young children full time in 2003, but never stopped doing technical work. She became the go-to point of contact for any IT-related issues that occurred during her kids’ extracurriculars. She also set up an online craft business which became an international success, selling knitted pieces world-wide. Mary was first introduced to the ReBOOT program through a friend, and when she started working through the online courses she was surprised to see how little things had changed. There was more functionality than she had ever seen – some of the terms and syntax were different – but the programming courses were just as she remembered. This gave her the reassurance that programming was programming regardless of time away. At the same time, Angela Morgan, a programmer with more than 10 years of experience working overseas in the San Francisco Bay Area and New York City, was also considering getting back to work full time. She was just a teenager when she started programming, and continued through university where she earned a degree in Applied Computing. She worked for a handful of companies in both Ireland and the U.S., and gained extensive programming experience until 2007 when she decided to take some time off to raise her family. Angela joined the ReBOOT initiative by means of her husband who came across an online ad, and leveraged the e-learning courses to refresh her skills. With each seminar she felt more familiar and more engaged, but most importantly more confident. After MongoDB reviewed a number of applications and interviewed five candidates who practiced interviewing skills and updated their CVs with ReBOOT, Mary and Angela were two of three women brought on to complete their two week work placement at the MongoDB office. They were placed on the Technical Services Engineering team, and Clare was their assigned mentor. “There is such a high caliber of women in the program,” Clare notes. “They are exactly what organizations are looking for but can’t seem to find because CVs don’t always tell the entire story. We were looking for skills aside from just technical. The women were out of date with some of the technology but they learned quickly and were easily brought up to speed. I introduced them to the MongoDB training courses, and had them set up a replica set – they succeeded at every task and worked very well as a team. They were extremely motivated, patient, and did a great job juggling customer cases and issues. They possessed the unique qualities that come from raising a family, and were able to apply them to work." After a two week term in the Dublin office working on a number of cases and projects and going well beyond their standard support responsibilities, it was suggested that if interested they apply for full time positions at MongoDB. Both Mary and Angela did apply, went through the standard MongoDB interview process, and after a few weeks both were extended offers to work at MongoDB full time, which they accepted. 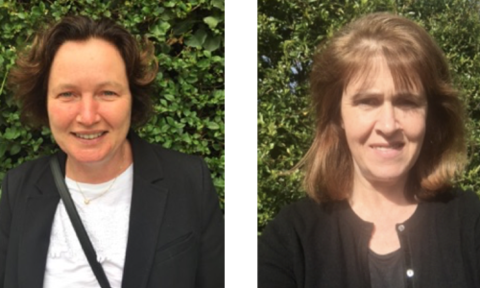 Mary Gorman is one of our newest Cloud Triage Support Associate and Angela Morgan has joined as a Cloud Support Associate, both on the Technical Services team. With so few women choosing the IT sector to begin with, the ReBOOT program was an incredible opportunity for us to connect with existing qualified talent and make two great hires to our team. Initiatives like Women’s ReBOOT help to set an example for the next generation so they never feel the need to chose between family and a career. ReBOOT will be offering another program opportunity this fall and we are looking forward to partnering with them again. Interested in learning more about Women ReBOOT? Click here.